On his No Reservations television program, celebrity chef Anthony Bourdain visited a “government authorised” bhang shop in Jaisalmer Fort, Rajasthan. 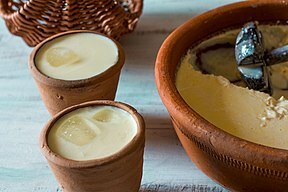 The proprietor offered him three varieties of bhang lassi: normally strong; super duper strong; and “full power, 24 hours, no toilet, no shower”. 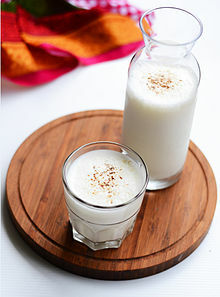 ^ “Indian Lassi: The Ultimate Summer Refresher”. Imbibe. Retrieved 29 May 2018. ^ Wayne Collins (1970-01-01). 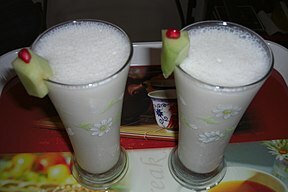 “Food – Recipes : Mango lassi cocktail”. BBC. Retrieved 2014-01-08. ^ “Can This Lassi Ad Really Be True?”. indiablogs.searchindia.com. 2008-10-04. ^ “HSBC Bank : Washing Machine and Lassi”. Adoholik. 2008-09-27. Retrieved 2008-10-19. ^ “HSBC Lassi/Washing Machines TV Ad”. HSBC. 2012-04-30. Retrieved 2013-09-23.